Last month, SEGA released Fantasy Zone II 3D in Japan, and on Aug. 20, the arcade version of Thunder Blade will be the next 3D Classic to join the list. Here’s a look at the classic display mode, complete with an authentic looking arcade cabinet. Thunder Blade 3D will feature an original 4:3 screen setting with an arcade overlay to give it that old, authentic feel of playing the original arcade version. However, you will also be able to switch to widescreen, if you prefer that, as well. 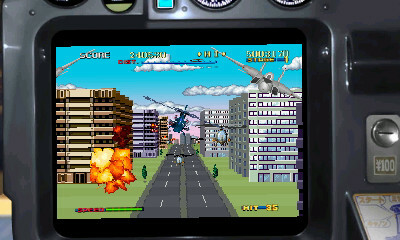 Controls support the analog and d-pad, or you can use tilt controls. 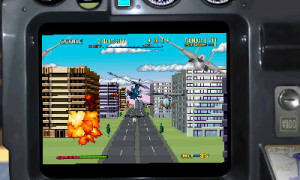 There is also a special mode included, which appears to have corrected several elements of the game and adding a final stage. SEGA has yet to confirm whether Phase 2 of the 3D Classics will be coming stateside. Released so far have been After Burner II, Fantasy Zone, Fantasy Zone II and OutRun. We actually just published our Genesis review of Super Thunder Blade yesterday, so go read that instead of being super bummed we still haven’t got any of these great classics!